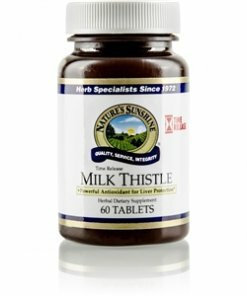 Nature’s Sunshine Milk Thistle Time Release is specially formulated to slowly and consistently furnish silymarin to the hardworking liver. One of the liver’s over 500 functions is ridding the body of toxins; silymarin may help to protect the liver from those toxins as it seeks to flush them from the body, allowing the liver to function at full-throttle. In addition to its protection of the liver, the silymarin found in milk thistle may block some toxins from ever entering the body’s systems which prevents subsequent tissue damage. Further, it is a rich source of antioxidants and encourages protein synthesis in the cells of the liver. 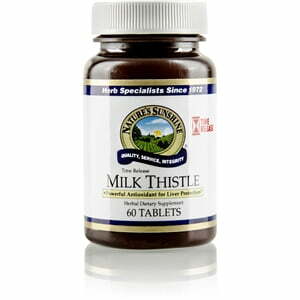 Milk Thistle Time Release comes in 350 mg capsules of milk thistle herb extract, consisting of 80 percent silymarin. Instructions: Take 1 tablet with a meal twice daily. Dicalcium phosphate, cellulose (plant fiber), and stearic acid (vegetable).